The Hunger Games: Could a real country have an economy like Panem’s? Could any real country have an economy like Panem’s? Actually, yes. 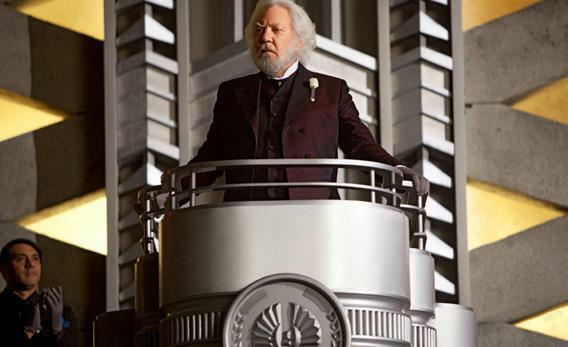 Donald Sutherland stars as President Snow in The Hunger Games. The nation of Panem is divided intro districts, and wealth and power are concentrated in the Capitol. Murray Close/Lionsgate. All rights reserved. The Hunger Games: Catching Fire, the second film based on author Suzanne Collins’ blockbuster trilogy, comes out today. Last year, on the release of the first Hunger Games film, Matthew Yglesias asked if a real country could have an economy like the fictional nation of Panem’s; that piece is reprinted below. At first glance, the economic landscape depicted in Suzanne Collins’ best-selling Hunger Games trilogy doesn’t make much sense. Despite its post-apocalyptic condition, the fictional nation of Panem is quite technologically advanced. It has high-speed trains, hovercrafts, extraordinary genetic engineering capabilities, and the ability to create extremely advanced weapons. And yet Panem is also a society of tremendous economic inequality, with clear examples of absolute economic deprivation and even famine. Economic theory teaches us that over the long term, prosperity is driven by two factors—capital accumulation and the “Solow residual” of technology—and that of the two elements the technology is more important. Perhaps the best example comes to us from the experience of Germany and Japan around World War II. These were, before the war began, prosperous, technologically advanced societies rich in industrial capital. They had the capacity, in other words, to build the tanks and bombs and aircraft carriers one would need to mount a successful effort at global conquest. But during the course of the war, the capital stock of both countries was run down to almost nothing by massive Allied bombing. In the very short-term, this impoverished both countries, but they bounced back remarkably quickly. Knowing how to build a prosperous society, in other words, was more important than actually having the physical stuff. So how can Panem, more than 70 years after the conclusion of its last major battle, be so poor and yet so rich in knowledge? A book released this week by Daron Acemoglu and James Robinson—the former a professor at MIT, the latter at Harvard—called Why Nations Fail can help shed some light on bleak conditions in District 12 but also why Collins doesn’t attempt to portray everyday life in many of Panem’s other districts. Acemoglu and Robinson’s general theory can be grasped through the lens of the “reversal of fortune” they observe in the Western Hemisphere and originally described in an academic paper co-authored with Simon Johnson. If you plot per capita income in the Americas today, you see a clear pattern with the United States and Canada ahead, the southern cone around Chile and Argentina in second place, and the middle portion much poorer. It turns out that if you turn the clock back about 500 years, the pattern was reversed. The places that are rich today were poor then, while those that are poor today were generally rich in the past. This, they argue, is no coincidence. When Spanish conquistadors showed up in the prosperous areas of Latin America, they stole all the gold they could get their hands on and then set about putting the native populations to work. They set up “extractive institutions” whose purpose was to wring as many natural resources (silver, gold, food) from the land as possible while keeping power in the hands of a narrow elite. These institutions discourage savings and investment, since everyone knows any wealth can and will be arbitrarily expropriated. And while the injustice of it all led to periodic revolutions, the typical pattern was for the new boss to simply seize control of the extractive institutions and run them for his own benefit. The original English settlers of today’s United States had much the same idea in mind. But the problem they ran into was a lack of Indians. There was no great civilization ready to pay its wealth in tribute and then be enslaved. The only way to make the land productive was to induce Englishmen to move there, which required the establishment of relatively fair political institutions. The southern United States wound up with a hybrid system based on both citizen-labor and imported slaves, while the northern U.S. had a pure free labor system. These political institutions led to an economic environment in which work and savings were rewarded, and broadly shared prosperity ensued—not coincidentally with the free area enjoying more prosperity than the slave belt. District 12 is a quintessential extractive economy. It’s oriented around a coal mine, the kind of facility where unskilled labor can be highly productive in light of the value of the underlying commodity. In a free society, market competition for labor and union organizing would drive wages up. But instead the Capitol imposes a single purchaser of mine labor and offers subsistence wages. Emigration to other districts in search of better opportunities is banned, as is exploitation of the apparently bountiful resources of the surrounding forest. With the mass of Seam workers unable to earn a decent wage, even relatively privileged townsfolk have modest living standards. If mineworkers earned more money, the Mellark family bakery would have more customers and more incentive to invest in expanded operations. A growing service economy would grow up around the mine. But the extractive institutions keep the entire District in a state of poverty, despite the availability of advanced technology in the Capitol. Similar conditions would apply to the plantation agriculture we briefly see portrayed in District 8, and presumably other commodity-oriented Districts such as 7 (lumber), 10 (livestock), and 9 (grain). On the other hand, Collins wisely avoids going into detail about what life is supposed to be like in Districts specializing in luxury goods or electronics. It’s difficult to have a thriving economy in electronics production without a competitive market featuring multiple buyers and multiple sellers. Absent market competition, personal computers never would have disrupted the mainframe market and the iPhone and Android never would have revolutionized telecommunications. Entrenched monopolists have no interest in developing new technologies that shake things up. It’s difficult to get real innovation-oriented competitive markets without secure property rights, and exceedingly difficult to have secure property rights without some diffusion of political power. That needn’t mean real democratic equality—a standard the United States and Europe didn’t meet until relatively recently—but it does mean fairly broad power-sharing, as the U.S. has had from the beginning. But Collins is right in line with the most depressing conclusion offered by Acemoglu and Robinson, namely that once extractive institutions are established they’re hard to get rid of. Africa’s modern states, they note, were created by European colonialists who set out to create extractive institutions to exploit the local population. The injustice of the situation led eventually to African mass resistance and the overthrow of colonial rule. But in almost every case, the new elite simply started running the same extractive institutions for their own benefit. The real battle turned out to have been over who ran the machinery of extraction, not its existence. And this, precisely, is the moral of Collins’ trilogy. [Spoiler alert: Ignore rest of this story if you haven’t finished the trilogy.] To defeat the Capitol’s authoritarian power requires the construction of a tightly regimented, extremely disciplined society in District 13. That District’s leaders are able to mobilize mass discontent with the Capitol into a rebellion, but this leads not to the destruction of the system but its decapitation. Despite the sincere best efforts of ordinary people to better their circumstances, the deep logic of extractive institutions is difficult to overcome, whether in contemporary Nigeria or in Panem.